Water Music Suite No. 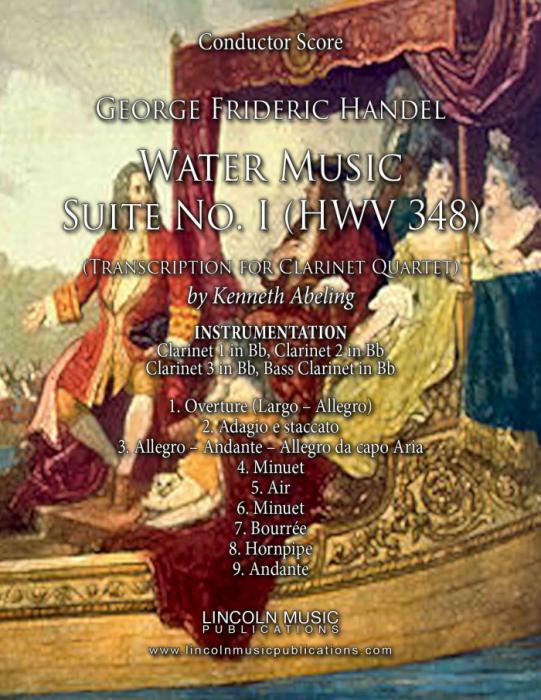 I in F Major (HWV 348) by George Friderick Handel transcribed for Clarinet Quartet by Kenneth Abeling. The Movements include: 1. Overture (Largo – Allegro), 2. Adagio e staccato, 3. Allegro – Andante – Allegro da capo Aria, 4. Minuet I, 5. Air, 6. Minuet II, 7. Bourrée, 8. Hornpipe, 9. Andante. Along with performance as a complete suite it is perfectly suited for use as individual movements, particularly for segments of Religious services or Wedding Ceremonies.